In the years 1792 to 1794 the crew of the "H.M.S. Discovery" under the command of captain George Vancouver was surveying the western coast of the North American continent, when they in October 1792 spotted a mountain and named it after the British diplomat Alleyne FitzHerbert, 1st Baron St. Helens (1753-1839). The origin of Saint Helens was however discovered by naturalists only in 1835, when a minor eruption revealed its volcanic nature. First geologic studies were carried out since 1841, when an expedition of the U.S. Army lead by Charles Wilkes reached the volcano; the summit was finally conquered in 1853 by newspaper editor Thomas J. Dryer. In November 1842 the missionary Josiah Parrish experienced an ash rain and earthquakes generated probably by the 130km distant St. Helens. 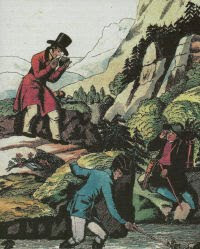 This phase of activity lasted until 1857. Fig.1. 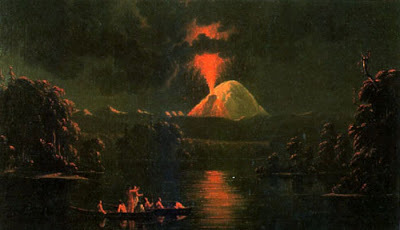 Painting by Canadian painter Paul Kane Mount St. Helens erupting at night after his 1847 visit to the area. However the local tribes know well the character of these volcanoes, St. Helens was called by the Klickitats the Loo-Wit Lat-kla - "Keeper of the Fire" or Louwala-Clough - "One from Whom Smoke Comes" and also Tah-one-lat-clah - "the Fire- or Smoking-Mountain". According to their legends, the mountain was once the beautiful princess Loo-Wit, who was disputed by two warriors in a battle of fire and smoke which buried entire villages and forests. To end the battle all three were transformed in mountains: the beautiful and shy princess became the symmetrical, ice covered St. Helens; the two angry warriors became the clunky Mount Hood in the south and Mount Adams in the west. This myth was possibly inspired by the observation of a prehistoric eruption of one of the mentioned volcanoes, but there are also direct eyewitnesses' reports: in 1800 the Sanpoil and Spokan Indians told to the first missionaries and traders visiting the area of an eruption occurring on St. Helens. "The people called it snow… The ashes fell several inches deep all along the Columbia and far on both sides. Everybody was so badly scared that the whole summer was spent in praying. The people even danced — something they never did except in winter. They didn't gather any food but what they had to have to live on. That winter many people starved to death." Minor eruptions with small explosions and lava flows occurred again in 1898, 1903 and 1921. It was this apparent tranquillity that lead until 1980 to believe that many of the volcanoes of the Cascades were dormant and not threatening, especially one of the youngest and smallest of them - like St. Helens. In 1969 geologists Dwigth Crandell warned during a congress in San Francisco that the continental volcanoes of North America were still poorly studied and monitored, and much more active than previously assumed. Based on dated deposits of past eruptions, Crandell published with Donal Mullineaux a paper in which he warned that "the scheme of activity of St. Helens led to the assumption that it is possible to postulate an eruption in the next 100 years and maybe even before the end of this century". In March 1980 finally a monitoring system was installed on St. Helens, also in response to increased interest of the volcanoes located along subduction zones, as is the Cascade Range, after a surprising destructive eruption in the sixties of the Arenal in Central America. The system registered from the very beginning onwards an increased seismic activity, until end of March earthquakes with a magnitude of 4 happened periodically, on March 27, an explosion occurred - it was now clear that St. Helens had entered a new eruption phase. The volcano became intensively monitored, in April the northern flank begun to rise, probably by intruding magma inside the mountain, an eruption was impending and therefore the area around the volcano was closed to the public. On Sunday May 18, at 8:32 an earthquake of magnitude 5.1 triggered one of the largest landslide-avalanche ever to be recorded (estimated 2.8 cubic kilometres of rocks and ice) on the northern slope of the mountain, followed by a gigantic explosion. In just 60 seconds the mountain shrinked from 2.950m to 2.549m, 600 square kilometres were devastated by a 600°C hot pyroclastic density current and the burst of the explosion. The melting glacier ice and the overspill of Spirit Lake caused lahars that devastated the valley of the Toutle Rivers. "Vancouver, Vancouver, this is it!". "The whole north side of the summit crater began to move as one gigantic mass,… The entire mass began to ripple and churn without moving laterally. Then the whole north side of the summit began sliding to the north along a deep-seated slide plane." Also many reporters, hikers and volcano enthusiast, located outside the danger zone, documented the eruption with photographs or descriptions. This video created with photographs taken by Gary Rosenquist, stationed at 18km northeast of St. Helens in the morning of May 18, shows the dynamics of the slope collapse and the pyroclastic explosion. The first photo was taken at 8:27, in the next 6 minutes he take a dozen photos before he escaped the approaching pyroclastic current. The landslide previous the eruption is well visible as the block moves downward, followed by the pyroclastic flow projecting first upward, then sideward and surpassing the landslide. The eruption at St. Helens was only a single event in the long history of the Fire Mountains of the Cascade Range, like in the fossil forest of Yellowstone many times the landscape was destroyed, reborn and modified by volcanic eruptions. Today St. Helens is monitored and the area protected to understand the colonization by animals and plants of a devastated landscape - a new chapter to be written in the geologic record.